While the soul of the outdoor enthusiast may not have changed much over the ages, the gear certainly has. No single piece of equipment has experienced this constant development more than the adventurer’s roving home: the backpacking tent. In the three decades that I’ve been blazing my way up and down trails, backpacking tent material and design have continued to evolve at a fevered pitch. Whether you’re considering a first-time investment or a trade-in for a new model, checking out the latest releases is always a good idea when it comes to tents. In this article, I’ve weeded through some of the choices out there to bring you the best backpacking tent for summer 2018. Founded in 1969 by an experienced engineer and voracious mountaineer Larry Penberthy, Mountain Safety Research (MSR) is dedicated to a surprisingly simple principle: higher-quality, safer gear is the key to unlocking a more satisfying adventure. In keeping with this, they focus on functionality and reliability. MSR rigorously tests all of its products and still produces many of them by hand, making them one of the most highly respected producers of outdoor equipment today. 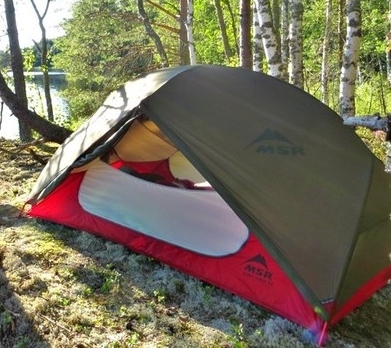 It is no surprise that MSR produces this year’s best backpacking tent: the MSR Hubba Hubba NX. The nature of backpacking makes choosing the best backpacking tent doubly important. Once you leave the relative luxury of the car or lodge, you will carry your selection by day and rely on its protection by night. As such, I’ve grouped the majority of my review into two primary categories. First, let’s examine how the MSR Hubba Hubba NX is the best backpacking tent for the duration of the overnight. Interior capacity refers to the space you inhabit within the backpacking tent. Since backpackers have to carry every ounce of comfort, the interiors of the best backpacking tents are designed with an acute eye for detail. 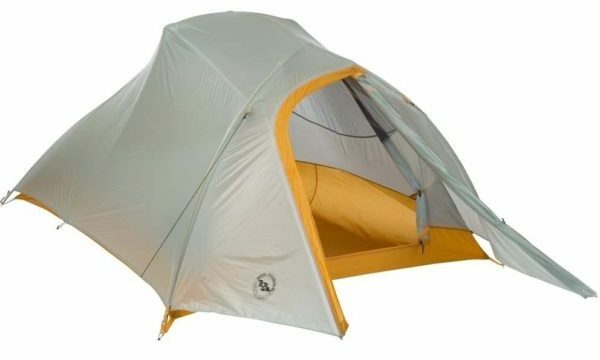 For simplicity and consistency, in this review, we are comparing the 2-person model of each tent. At 29 ft2, the MSR Hubba Hubba NX is neither the largest nor the smallest backpacking tent in our review. The 84” x 50” dimensions are rectangular. This design choice maximizes square footage but gives a sleeping backpacker much more room at one end, as shoulders take up much more room than feet. Two backpackers sharing the tent may decide to sleep head-to-foot or store the majority of the gear at their feet. Note that the 84” (7 feet) length is the shortest backpacking tent in our review and not well-suited for taller backpackers. The peak height of 39 inches for the MSR Hubba Hubba NX is relatively low. However, that measurement alone does not fully describe the vertical space afforded the backpacker. Unique pole construction billows the tent walls outward, maximizing head and elbow room. Just by looking at photos, you can see how much backpacking tent design and construction varies. In recent decades, contenders for the best backpacking tent have gone away from traditional A-frame design in favor of more minutely engineered shapes. Vestibules are the eaves of a tent and shelter backpackers upon entry and exit. Furthermore, vestibules provide a measure of defense for shoes, packs, and other gear left just outside the doors. At 17.5 ft2, the vestibule space of the MSR Hubba Hubba is adequate for two hikers and ample for one. While this square footage is not protected by the walls and screens of the tent and cannot simply be added to the interior space, it is still a critical consideration. An ample amount of 15D (Denier) mesh under the rainfly allows breezes in and vapor from respiration out. The rainfly and vestibules are also vented to increase this effect, making the MSR Hubba Hubba a very airy backpacking tent. For the sake of consistency and in keeping with the theme, all tents in this review are considered ‘3 Season’ tents. These contenders for the best backpacking tent are best enjoyed during spring, summer, and fall at moderate elevations in temperate climates. Like the majority of backpacking tents, the MSR Hubba Hubba NX utilizes a combination of breathable tent-walls with an impermeable rainfly. The rainfly is a tough 20D ripstop nylon fabric that extends the full length of the tent and vestibules. Durashield™ polyurethane and silicone coating ensures that the fabric is completely waterproof. Two large StayDry™ doors prevent water from dripping in the tent when opened. At their maximum, they dilate the entire aperture of each end of the tent, allowing for enormous versatility. 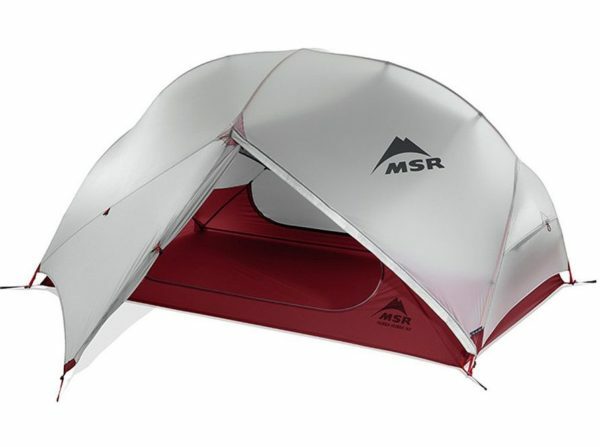 The MSR Hubba Hubba NX is a freestanding tent. While you may use the stakes for additional support or to pull the rainfly away from the walls, the tent will stand on its own using just the poles. A Fast & Light® setup option allows the fly and poles to be used with only a footprint (sold separately), reducing the trail weight to 2 lbs, 2 oz. The nightly comfort and protection of your tent should be only half of the consideration. The size, weight, and packability of the MSR Hubba Hubba NX couple with its function to make it the best backpacking tent of 2018. If you do a bare minimum of research into the best backpacking tent, you’ll notice many different weights listed for each product. Two of them, trail weight and package weight, factor into our review. Trail weight (or minimum trail weight) is probably the most important single weight when considering the best backpacking tent. Minimum trail weight refers to the weight of only the tent, rainfly, and poles. The MSR Hubba Hubba NX comes in at an impressively low minimum trail weight of 3 pounds, 7 ounces. Package weight encompasses everything the manufacturer sends with the tent. In addition to the items constituting the trail weight, the package weight includes the stakes, tie lines, bags, and any other accessories. The package weight for the MSR Hubba Hubba NX is 3 pounds, 13 ounces – 6 ounces heavier than the minimum trail weight. In reality, most backpackers carry their tents at somewhere between these two weights. Modern construction makes the packed size of contenders for the best backpacking tent remarkably small. The MSR Hubba Hubba NX takes up only 6 inches by 18 inches. This is small enough to fit into an interior compartment of most interior or exterior frame backpacks. An ultra-compact compression sack aids in this process. The setup and take down of all modern backpacking tents is vastly simpler than that of their predecessors. You can erect the MSR Hubba Hubba NX in low light or adverse weather conditions. A color-coded hub and pole system eliminate any guesswork. DAC aluminum poles partially keep their shape after the first use, increasing ease of setup. For backpacking tents, durability counts twice: once for the current excursion and again for the life of the product. The MSR Hubba Hubba NX is constructed from premium materials. Ripstop nylon and DAC aluminum are lightweight but resistant to damage. Denier (D) is a measure of material thickness. The higher the number, the thicker the material. 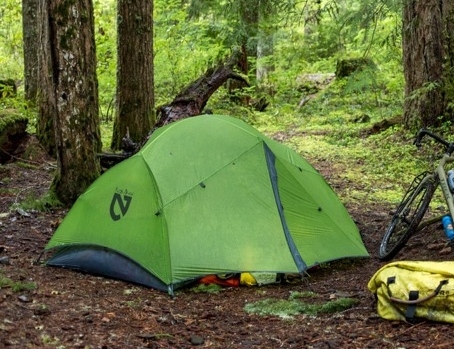 At a minimum, backpacking tents have a denier rating for their canopy, rainfly, and floor. This measurement is a great indicator of durability but is also a consideration for comfort. 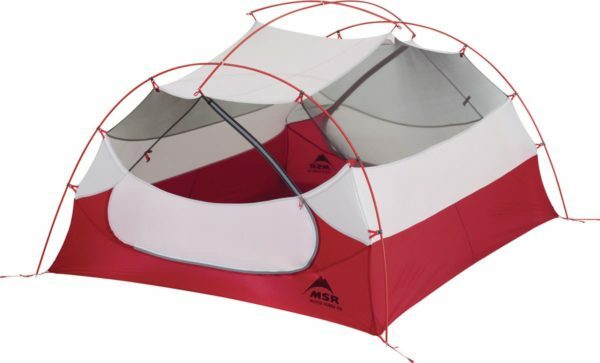 The MSR Hubba Hubba NX has a 30D floor, 20D rainfly and canopy, and 15D mesh for the windows. This moderate thickness provides a degree of protection while still keeping weight low. Not even the best backpacking tent is perfect. Here are a couple areas of concern for the MSR Hubba Hubba NX. The aluminum 9.3 mm diameter poles are vulnerable to bending in high winds. Several reviewers note that the MSR Hubba Hubba NX is great for mild weather but not much defense against heavy winds or storms. Whether or not this is a consideration depends on the location and duration of your outing. The rainfly for the MSR Hubba Hubba doesn’t extend all the way to the ground. While it should protect against rain, this construction allows wind and cold temperature to press against the tent walls directly. New England Mountain Equipment (or Nemo Equipment) was named in tribute to Jules Verne’s fictional Captain Nemo. Founded on a principle of minimalistic engineering, Nemo Equipment champions design perfection and conservationist philosophy. With the slogan ‘design like you give a damn’, Nemo employees vow to never put anything new into the market that isn’t a verified improvement over the old. 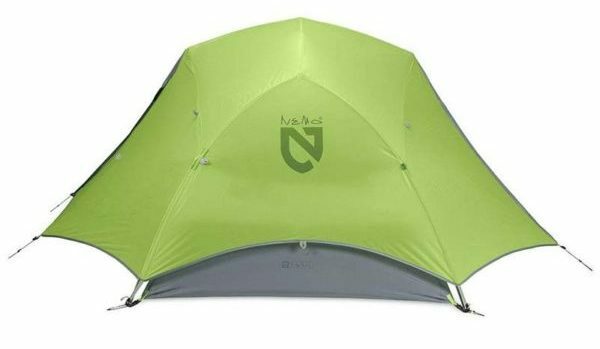 These principles shine through in their production of our best backpacking tent runner-up, the Nemo Dagger. When it comes to features of nightly comfort and convenience, the Nemo Dagger gives the MSR Hubba Hubba NX a run for its money. The interior of the Nemo Dagger is certainly designed like someone gave a damn. Let’s explore the individual elements. At 31 square feet, the Nemo Dagger has the largest floor space in our review. Like the MSR Hubba Hubba NX, it is a rectangle, which gives the most area for the material. It does, however cramp two sleepers at the shoulders unless they sleep head-to-foot. The dimensions are a generous 90” x 50”, six inches longer than the MSR Hubba Hubba NX. This is probably the best backpacking tent for taller adventurers. At a peak height of 42”, the Nemo Dagger is also the tallest backpacking tent in this article. For the weight, this is a very generously proportioned tent. Well-positioned hubs for the tent poles maximize the livable volume of the interior. The Nemo Dagger has two HUGE vestibules, for a combined 23 square feet. This is 75% as much room as the entire interior of the tent. Experienced backpackers will tell you that this semi-protected space is invaluable for improving your living conditions. The Nemo Dagger has ample mesh pockets in the interior. One or two nights in a new tent will reveal how critical it is to have items like flashlights, eyeglasses, and toilet paper quickly at hand. This tent also has an overhead sleeve designed to hold a headlamp or flashlight. Special material diffuses the light illuminating the entire interior. As you can see from the pictures, the majority of the canopy is 20D nylon mesh. The rainfly is well-engineered to protect this fabric without contacting it directly. The Nemo Dagger is very well-ventilated. A generous rainfly of 20D nylon protects the Nemo Dagger. The larger vestibules extend this fly out away from the tent, offering a further buffer from the elements. Both the doors and the corresponding vestibules are a matching trapezoidal shape to maximize the aperture. The poles are remarkably thin and simple to use. They are also somewhat interchangeable, which is especially handy if you’re setting up your tent in the dark or during difficult conditions. The Nemo Dagger comes with stakes but is also freestanding. If you are concerned about weight or will be erecting the tent on rock, you may leave out all or most of the stakes. Besides being incredibly light for its size, the Nemo Dagger has several unique features that make it extremely user friendly. The minimum trail weight of the Nemo Dagger is 3 pounds, 5 ounces. This is remarkably light considering the interior room. Remember that minimum trail weight does not include stakes, bags, guy lines, or any other accessories. The Nemo Dagger has a package weight of 3 pounds, 12 ounces: 7 ounces more than the minimum trail weight. Although it has a lighter minimum trail weight than the MSR Hubba Hubba NX, the additional weight is greater, possibly because the Nemo Dagger includes a small repair kit. The Nemo Dagger packs down to 5.5 in x 19 in, virtually the same volume as the MSR Hubba Hubba NX. However, the Nemo Dagger Divvy Sack allows you to easily split the components of the tent evenly between two hikers. This is a great design element. The erection and strike of the Nemo Dagger are easily accomplished by an amateur backpacker in difficult conditions. Versatile, interchangeable poles and clips make the assembly intuitive. The single hub pole design facilitates very rapid construction. 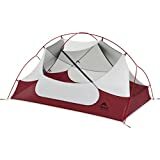 Even smaller backpackers with less reach and upper body strength will not struggle with this tent. Furthermore, all connection points on the exterior of the Nemo Dagger are reflective. This aids in assembly and increases the safety of the tent. Like the MSR Hubba Hubba NX, the Nemo Dagger is built to be lightweight, so durability is not a strong selling point. That said, if you treat the equipment with care and recognize the limitations, this 3-season tent will serve you well at a modest elevation and temperate climate. The Denier (D) of the Nemo Dagger is almost identical to that of the MSR Hubba Hubba NX. The 20D nylon composes all of the upper components and 30D nylon functions as the floor. If you’re more worried about punctures than weight, Nemo sells a ‘footprint’ for the Dagger. This is a common backpacking tent accessory and is basically a custom-made ground cloth. Multiple reviewers complain that the door and window zippers snag against the light nylon mesh of the canopy. Since the mesh is as light as 20D, even a small snag can cause a hole which can let in insects. While this can arguably be prevented by careful use, it is a consideration. If you stake the Nemo Dagger out very tightly with the door open and then try to zip it, you may be left with a gap. Again, this flaw can be avoided by some knowledge and corrective handling. When it comes to competition for the best backpacking tent, ultralight tents almost need their own category. Although there is no technical definition for what makes a backpacking tent ‘ultralight’, tents that come in under 3 pounds are generally given this designation. These tents favor weight reduction over durability and are preferred by backpackers attempting challenging terrain. However, an ultralight tent is not the same as a bivy, which only protects the body of a single backpacker. 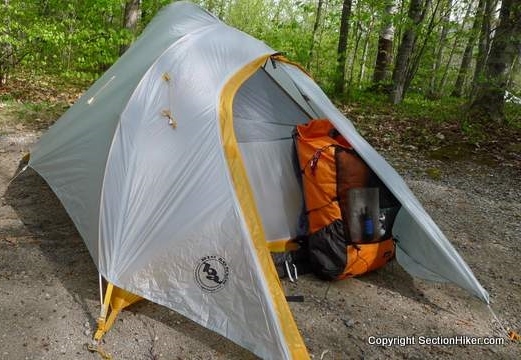 The tents we compared for this review still have enough space for two occupants and a small amount of gear. Despite the name, Big Agnes can make a really light tent. Founded in 2000, Big Agnes is another wilderness outfitter staffed by the same kind of adventure seekers they appeal to. With a ‘go hard or go home’ attitude, Big Agnes markets specifically to thrill seekers: customers who will push themselves and their gear to the limit. With this in mind, it’s no surprise that we selected the Big Agnes Fly Creek UL for best backpacking tent: ultralight category. When you learn exactly how light the Big Agnes Fly Creek UL is, you’ll be surprised by the creature comforts it offers. Let’s start with the layout when this tent is in use. The Big Agnes Fly Creek UL is a snug but functional two-person tent. The award-winning design leaves room for movement and comfort on the interior. With 28 square feet of floor space, the Big Agnes Fly Creek UL is only one square foot smaller than the winner for best backpacking tent, the MSR Hubba Hubba NX. At 86” long, it is actually 2 inches longer! Unlike both the MSR and Nemo, the Big Agnes does not have a rectangular floor. One end is an impressive 52” wide while the other tapers to only 42”. In keeping with its impressive floor space, the Big Agnes Fly Creek UL is 40” at peak height, which is taller than the MSR. All this makes for a surprisingly roomy interior. As we’ve discussed, the dimensions alone do not dictate the functionality of the tent. 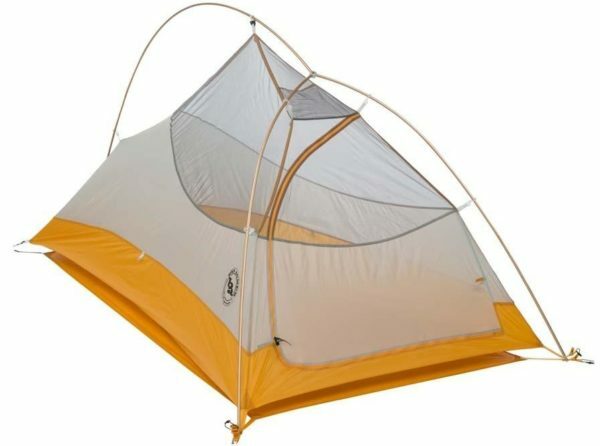 The Big Agnes Fly Creek UL has some additionally impressive design elements. The Big Agnes Fly Creek UL has a single vestibule at its larger end, which is only 8 square feet. However, a ‘dry entry brow’ above the vestibule helps keep gear dry as you pass through. Three interior mesh pockets and additional loops accommodate and organize gear for easy storage and access. The same super thin materials that make the Big Agnes Fly Creek UL light keep it well ventilated. The rainfly is both silicone-treated and polyurethane-coated. This adds almost nothing to the weight but still makes the Big Agnes Fly Creek UL completely waterproof. Due to its trapezoidal design (and to cut weight), this ultralight tent only has a single door. This can make it more challenging to accommodate two occupants comfortably. DAC Angle SF hub and poles make the sidewalls of the tent higher without increasing any weight. This helps to increase the cubic capacity of the tent and allow for more shoulder and headroom. The Big Agnes Fly Creek UL comes with 11 aluminum J stakes. Depending on the terrain and configuration you plan to erect the tent, you may not need all these. However, it is important to note that this ultralight tent is considered ‘semi-freestanding’. This means that for the tent to function properly, the backpacker must use at least some of the stakes or tie the guy lines to a sturdy object such as a tree. Now we come to the truly impressive credentials of our winner for best backpacking tent: ultralight tent. The Big Agnes Fly Creek UL packs down to a volume and weight that was unheard of until very recently. The minimum trail weight of the Big Agnes Fly Creek UL is 1 pound, 15 ounces. That is about the weight of a 500-page hardback book. At 2 pounds 5 ounces, with all of its stakes and accessories, the Big Agnes Fly Creek UL is still a pound lighter than the minimum trail weight of the MSR or the Nemo. The Big Agnes is also designed to be used with a footprint (ground cloth) that is sold separately. By assembling only the footprint, poles and rainfly, minimalist backpackers can reduce the weight of this ultralight tent even further. The Big Agnes Fly Creek UL packs down smaller than any other contender for best backpacking tent. The entire stuff sack only takes up only 4” x 19”. As you might expect, the Big Agnes Fly Creek UL is a cinch to erect and tear down. Engineers crafted the pole design around a single hub. Lightweight plastic clips require minimum upper-body strength to easily snap into place. If you were doing the math when we described the ample volume for an impressively low minimum trail weight, you won’t be surprised that durability is literally the weak area for the Big Agnes Fly Creek UL. Like all ultralight tents, this model won’t stand up to aggressive weather conditions. Backpackers also need to be especially cautious of damage caused by the ground. If you are not as concerned with weight, the optional footprint will greatly improve the durability of the Big Agnes. In order to get the weight down, designers of the Big Agnes made components like zippers as small and thin as possible. 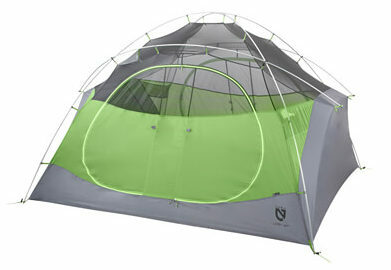 Reviewers complain that this tent doesn’t stand up to aggressive treatment. Even though the square footage of the floor is almost that of our two heavier contenders, the 42-inch width at one end makes for a major pinch point. This claustrophobic effect is exacerbated by the fact that the Big Agnes Fly Creek UL only has one door. If you’ve read any of my other product comparisons, you know that I dodge making a firm suggestion in this final paragraph. The secret to selecting the best backpacking tent is no secret at all. Gather as much information as you can and then select the equipment that best suits your personality and needs. If you want a medium-weight, medium durability backpacking tent then both the MSR Hubba Hubba NX and the Nemo Dagger are miraculously engineered products that represent the best on the market. If you want to sacrifice some comfort and durability for an impressively light two-person backpacking tent, you can’t do better than the Big Agnes Fly Creek UL. Whatever you choose, take it for a test run in your living room or backyard. Learn your new product in comfort and safety. Then go out there into the wild and make a story that you can bring back to us. See you on the trails! Q: What is a bivy? A bivy sack or bivouac sack is an extremely lightweight waterproof shelter for a single sleeper. Bivy sacks allow very little interior movement and are not designed to house gear. They are generally preferred by mountain climbers and other adventurers who prioritize hiking extremely light. Q: Can I buy one tent for use backpacking and car camping? Of course! Beginning adventurers often buy general use gear and then specialize as their tastes develop or their wallets increase. Although on the smaller side, either the MSR Hubba Hubba NX or Nemo Dagger would be solid choices for car camping. Generally, crossover-use tents range from four to six pounds and house from two to four sleepers. Remember that it is possible to break up the components from a larger tent between multiple backpackers! Interested in taking more of the family on your outdoor excursions? Check out Kelly Berry’s pick for the Best Hiking Baby Carrier.